Dear National Strength and Conditioning Association, I am a female strength coach. I have been a Certified Strength and Conditioning Specialist (CSCS) for 5 years. As a fresh-out-of-college kinesiolgy major, I couldn't wait to earn my CSCS; after all, it is the gold-standard of strength certifications. I was so very proud when I passed the test and added those four letters to my email signature. Once I earned them, I stepped into the world of the strength industry. I discovered that there are many beast women out there, and many of them are strength coaches too. Molly Galbraith, Nia Shanks, Naghar Fonooni, Jen Sinkler, all the ladies over at Breaking Muscle... the list goes on and on. These are all intelligent, strong women who pick up heavy things. They are amazing coaches and I am continually encouraged by what these coaches do for the strength industry (not just for women, but the industry as a whole). I'd like to think that I have at least a small impact on the industry as well here in northern Virginia with SAPT. I may not be as influential (in the broader sense of the term) as the aforementioned coaches, but I am proud to be a compatriot in the industry and relish telling people I am a "strength coach." I don't swear often, but I think the occasion warrants it. First, she's holding 5lb dumbbells- really? My 50-year old ladies press more than that! Secondly, how come it's the guy coaching her? Thirdly, why is he standing so close to her? Does she really need a spot with those super heavy dumbbells. Heavens forbid she hurt herself with dumbbells that weight less than my cat! I mean, really NSCA? Of ALL the pictures of strength training out there you chose this?! You're in an wonderful position rise above a silly women's fitness magazine, yet you placed your organization on that level with this image. You are supposed to tell your members that strength is desirable, encouraged, and prized. You should be the antithesis to the general media's portrayal on women's fitness. You should proudly display photos of women AND men performing feats of athletic prowess. How about a picture of an athlete and coach that actually display what strength coaches do- like coaching a heavy squat, or a power clean, or sprints? Why did you choose a picture that perpetuates the subliminal message that women shouldn't lift more than 5lbs? 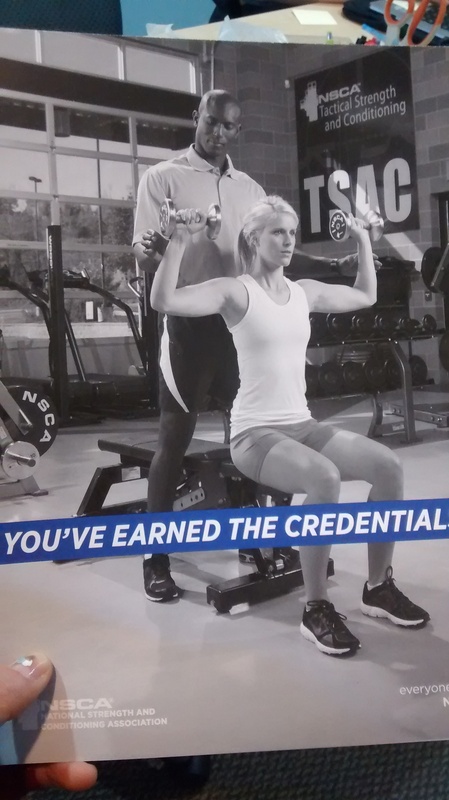 Why are you demeaning the hundreds of female strength coaches out there by your ridiculous photo? As the colloquial expression goes, "Do you even lift?" NSCA, please stop insulting us. Newer PostCan Sports Save The Planet?